Gobi Masala is a very popular North Indian dish. 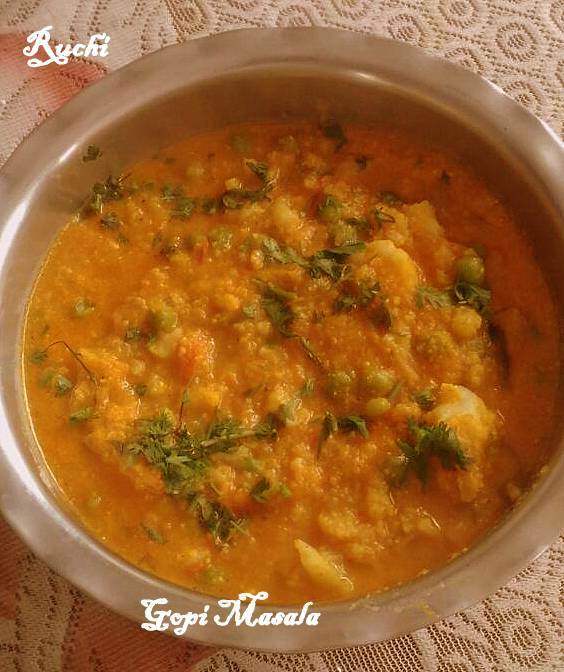 Gobi Masala cooked in spices gravy makes this dish exotic.This yummy & delicious dish goes well with roti, chapati, naan, jeerarice, peas pulao and many flavored rice dishes. 1.Cut cauliflower into bite size pieces. Wash it well and put them in hot salted water and Boil for few mins. Drain the water completely & keep the florets aside. 2. Soak cashew nuts in boiling water for 10-15 minutes. Drain the water and keep it aside. 3. Chop onion and tomatoes finely and grind chopped tomatoes and cashew nuts to a smooth paste. Keep aside. 4. Heat 2 teaspoons of oil in a pan or kadai. When the oil is hot enough, add the cauliflower florets and lightly fry them. Transfer them to a plate and keep aside. 5. In the same kadai heat 2 tablespoons of oil and add bay leaf ,cinnamon and cloves till spices sizzles. 6. Now add the chopped onions, and saute till they turn golden brown. Add ginger garlic paste and saute till the raw smell of ginger garlic goes off completely. 7. Then add the powdered masala, turmeric powder, red chili powder, coriander powder,jeera powder, garam masala, salt and stir in a medium flame until the raw smell of masala goes off completely. 8.Now add the prepared tomato cashew paste and kasuri methi andCook on a low flame till the oil separates on the sides of the pan.Then Add water and bring it to a boil. 9.Finely add the fried cauliflower florets and cook for a few more minutes till everything gets blended or until the gravy is thick enough. Now gobi masala is ready. 10. Garnish with coriander leaves and serve with roti, naan,Rice.